For all the talks of unity, it so happens sometimes that the tact of politicians seem right- We are divided at the core. “Excellent brand new 2BHK fully furnished flat with cross ventilation, natural light. Cosmopolitan society, no Muslims, with car parking on immediate sale, fifth floor interested please call”. 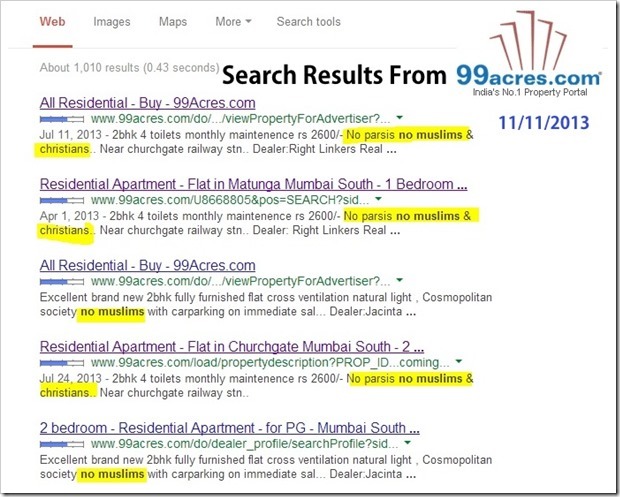 We decided to do a quick check on the site 99acres.com to see if there were still any listings that said “No Muslims”. Our Google search yeilded not one or two but over 1000 results. When we clicked any of those links, the actual listing from the pages have been removed. Here is a screenshot of 1000+ search results on 99 acres! The advt in question was posted on the site sometime back and was removed on Nov 2. Before it was removed however, it was quite propagated to social networks and a lawyer and social activist Shehzad Poonawalla filed a petition with the National commission for Minorities. While she has directed the case towards both the broker and 99acres.com, the company will be protected by its fine print. The rampant discrimination that is still present in the society. The issues with an open listing. Lack of tact in writing the listing. The first one is out of scope and pretty much impossible to discuss in short. It is here and while we may sweep it under the rug, it rears its ugly head in such times. The second is the lack of filtering that such postings have. As there are thousands of postings being done every day on such sites it is quite resource intensive to put an effective filter on it. Also, as the rules on internet are lax in India compared to countries like US, there is obviously an air of carelessness about the whole system. The third point is something that is of more prominence for me. The days where you could do or say anything and get away with it are long gone. With mobile phones having cameras and internet archive where everything stays forever, the world has moved to a very unforgiving place. In such a scenario, one cannot simply put words out there as they might not just hurt others but end up backfiring on you. There is a thing called online etiquette that a country just finding the roots of internet needs to learn. We are fairly young internet population with good broadband (or 3G) speed only just making itself easily available in the country. It might take some time for things like tact to come into place.